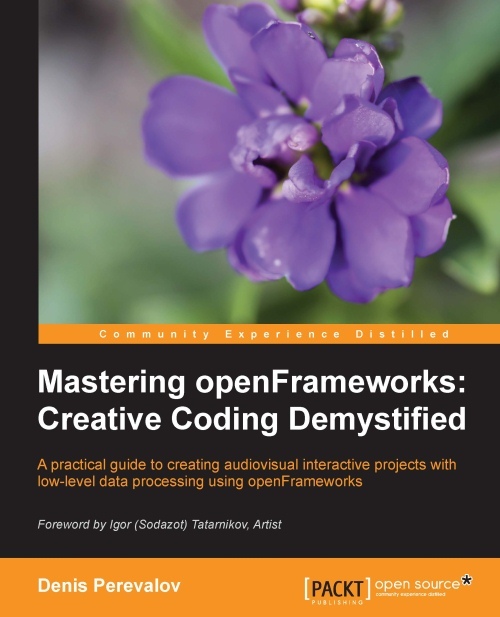 This Website is dedicated to my book Mastering openFrameworks: Creative Coding Demystified which was published by Packt Publishing (2013). To see videos and images exposing the book’s examples – go to Examples. To see videos of our real projects, used for creating book’s examples, and real projects made from book’s examples – go to Projects based on book. You will learn everything you need to know to create your own projects, ranging from simple generative art experiments to big interactive systems consisting of a number of computers, depth cameras, and projectors. This book focuses on low-level data processing, which allows you to create really unique and cutting-edge works.